Hip Hop and Breakz: Mobb Deep's Demo Tape? I'm going to try and upload a few treats between now and the New Year for those of you who check Hip Hop and Breakz on the regular. The first of these treats is a collection of Mobb Deep tracks that were recorded in between their 'Juvenile Hell' album and their Loud debut 'The Infamous' in or before 1994. I'm a big Queensbridge fan and in particular Mobb Deep. I think its often underestimated how much Havoc's dark and ominous production style influenced the whole sound of the East throughout the mid to late 90's and beyond. Some of these tracks went on to become tracks on the 'The Infamous', tracks like; Give up the Goods, Up North Trip, Survival of the fittest and Temperature's rising. Whereas some of the other tracks have only ever shown up on mix-tapes and dodgy bootlegs. I'm unsure if this really is Havoc and Prodigy's pre Loud demo but it certainly is a nice little collection of tracks that deserve their place in any Mobb Deep fan's collection. As you would expect the sound quality is'nt the best but the production is unmistakably an early example of Havoc's style. The rhymes are vintage Hav and P, slightly threatening and vividly morbid. With a guest appearance from another QB General, Illa Ghee. Check it out and post any comments you may have. 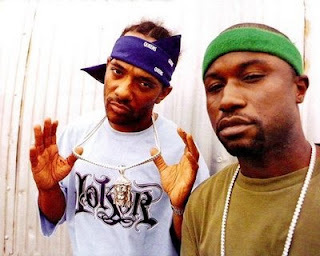 I will try and up some more rare Mobb Deep tracks later on this week, so check back soon.